Arrived on the Sunday morning to what turned out to be an incredible social week at a stunning venue around 22.5 acres with a quality group of lads. I hadn’t been fishing for a couple of months prior to this week so I was itching to get back into the flow of things, the fishing was different to what I had been used too. Fishing at ranges of around 170-190 meters with almost everything being boat work. Swims were all chosen months prior to arriving at the lake through a draw. Myself and the father drew out swim 1. With 5 swims on the lake everyone gets a good share of water. The special thing about swim 1 is, unlike any other swim on the lake it fishes it’s own water, completely cut off by the rest of the lake due to a floating rope with buoys stretching across the lake width wards and then a separate rope blocking access to an out of bounds area. Arrival into the swims was after midday as the group of anglers on before had a late pack up, as I was with the father he asked me which side of the swim id prefer. Left hand side of the swim being more open water fishing and the right hand side having access to its own small bay, now me being me and not able to ignore margins no matter what anyone tells me and that bay looking super carpy with bushes and overhangs I opted for the right hand side of the swim. As I was loaning a boat for the week from x boats U.K. I had to wait for a quick lesson on the equipment before I could start preparing the rods and search some spots out, as it turns out the boat is simplicity itself so the lesson didn’t take long! 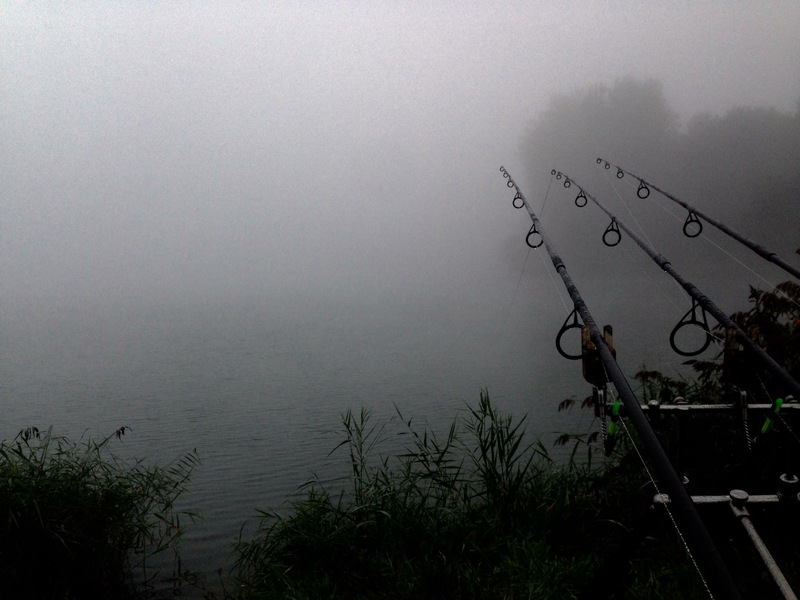 Whenever I fish somewhere for a long length of time, for example a week in this case, I always have a rod on a spot that I try to leave for the duration hoping a larger single moving fish finds the bait whilst my two other rods are on the ‘going spots’. Feed bait for the week I was using was a mix of CR1 and CR2, the baits were air dried before hand so I added CR juice to rehydrate them, thus stopping any cracking on the needles and adding that extra bit of attraction. Half chopped and half whole with a small amount of hemp and some robin red juice to give it that extra dash of colour and attractant. 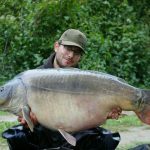 The right hand bay is called “no carp bay” and the lake shelved off out of the margins to around 4.2 meters and the opposite side shelved up from 4.2 with a slight plateau at 3.8 meters before continuing its rise up to around 1 meter. Four Rods per angler being the rule I opted for three as fishing at distances like that and a lake full of huge grass carp and sturgeon could end in mass wipeouts so I chose to not complicate things and put all my attention into the three rods. Which wasn’t a problem as it turned out. 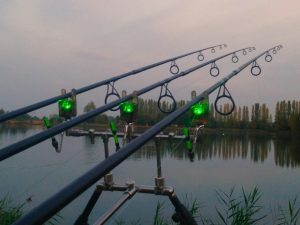 fishing with 16lb line and 5 rod lengths on each rod of 50lb fluorocarbon leader hoping to combat cut offs from the large obvious bars that stretch out across the lake and numerous mussel beds. 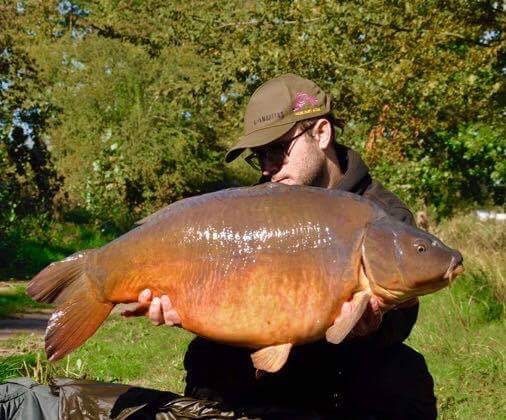 Coming down from the leader to Sharp Tackle lead clips and a stretched out rubber to insure the lead dropped off every take, down to 30lb stiff hooklink with around 6 inches stripped clear to form the hair and secure the hook. The hairs were fairly long as I started fishing on CR baits deadly CR2 using double bottom baits. I used a mix of CR baits, with CR2 being the preferred hookbait. 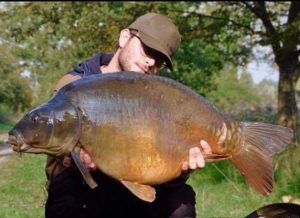 Hooks were sharp tackle size 4 wide gapes and more than up to the job at hand, sticky sharp straight out of the packet, suffering one hook pull during the whole week the results speak for themselves. Lead sizes were around 6+ ounces, reason being you don’t want to be fishing at 170+ meters get a strong crosswind and have your perfectly placed rig dragged out of your spot before the fish can pick it up. The left hand rod was fished 178 meters out in front towards swim 5 just as the bottom settles at 6m depth and the right hand rod was out at 180+ meters further to the right than the left hand but this also was dropped on 6m depth. The first afternoon went silent and quick, I must’ve got the rods out between 5-6pm and the only fish activity I had seen was in the out of bounds area and towards the opposite end of the lake. 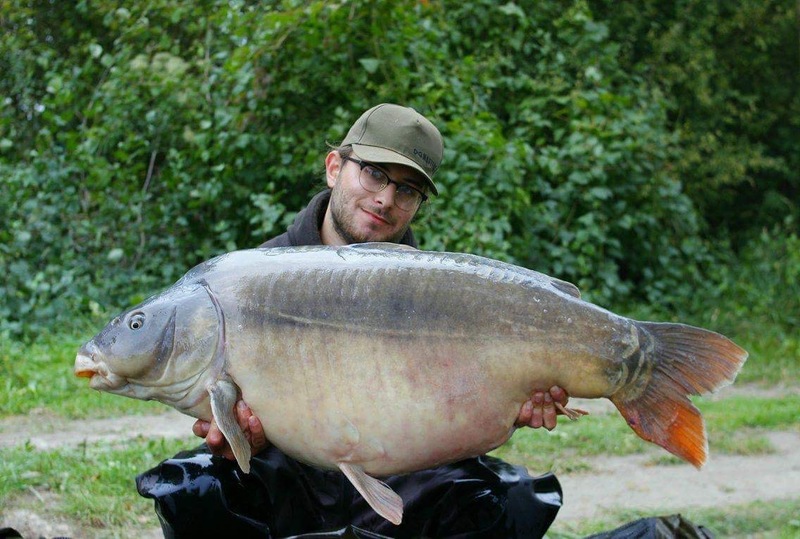 The lake itself has an enormous stock of large carp so even if fish are showing down the opposite end, there isn’t enough water for all the fish to be void of your swim at all times. The night passed as quick as the afternoon and I was on netting duty for most of it! I don’t remember the times I was awake but I can tell you I was awake longer than I was asleep, something that became quite a habit throughout the week. The father being the angler for the night and not the ghillie landed 4 carp, three upper twenties and a cracking fifty. Creating just enough buzz to keep me pushing on! I need not of worried as after juggling around some rods to find some spots I managed to land a carp off my ‘no carp bay’ rod, awesomely proportioned and a dark chestnut colour around mid 30’s. From that point on I was getting the rods out fresh for the nights around 6pm and resting the swim during most of the days and getting multiple takes throughout the nights, 3/4 nights I was left with just one rod in the water by morning as I’d experienced complications through the night and not been smart enough to charge the batteries for the boat beforehand! Schoolboy error. Around the 4th day the weather changed from having clear blue skies to overcast which changed my views and I decided to keep at least two of the rods out during the day, something that I went on to thank my lucky stars for. At 17:34 whilst I was sitting with Dad my left hand rod pulled up tight and the tip bent down, I quickly ran to the rod and lifted into what felt like a snag.. with an engine. I needn’t have worried as dad made light work of his netting duties and scooped up the Goliath pig wallowing on the surface. Having a steep bank to contend with I decided to put the waders on and jump in with it, after collapsing the net and lifting the fish out of the water it can’t of been an inch above the water when the net gave an almighty rip sound and the fish almost completely escaped through a giant tear in the bottom corner. 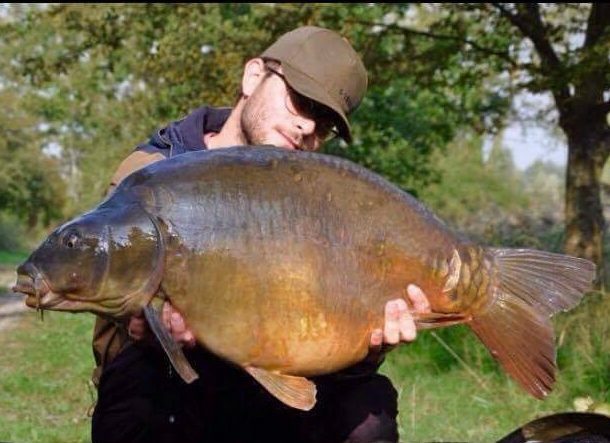 The fish as most people have seen due to sharing through social media went 59lbs and was a beautiful looking mirror. Big thanks to Mr.Flewin for the photos! After that drama I was completely made up and it wouldn’t of bothered me one bit if I didn’t put the rods back out, so I did what all anglers would do in my position.. I waited around 5 minutes and then once again put the rods out for the night. The action kept coming although daytime bites mostly led to captures of sturgeon and grass carp. Towards the end of the week the action slowed down and my last night on the lake was a blank! After reeling in, one rod had an old bag of boilies hooked on it covered in mussels and the other rod had a big stick side hooked! What could’ve been we shall never know! But a great week was had by all with some top grub, far too much alcohol and some great fish!